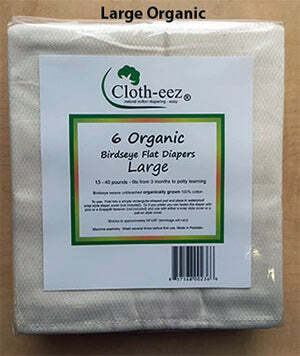 Cloth-eez® Birdseye made of organic cotton flat diapers are Oeko-Tex certified. Save when buying in packages of 6. We also have white in stock. Use Coupon Code BESTFLATS15 to save 15% now through Earth Day, April 22. EXTENDED through April 23. 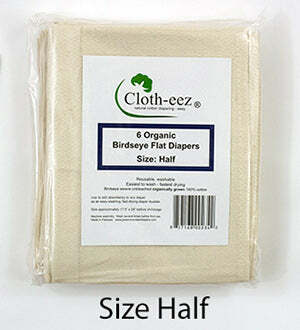 Size Half made of Organically grown unbleached cotton off-white edge stitch, for preemies or small newborns 4-8 pounds as a diaper, or to potty learning as a doubler for extra absorbency, approximate size 16 x 27.5 inches after washing. Size Small/One-Size made of Organically grown unbleached cotton red edge stitch 6-35+ pounds. 29x29 before washing and shrinks to approximately 28x26.75 inches. Size Large made of Organically grown unbleached cotton off-white edge stitch 13-40 pounds. 33x35 before washing and shrinks to around 30x30 inches. See this on a baby and find the how-to fold flats video link. The organic version runs a little bit larger than the white version. Note the measurements. All measurements are approximate. 100% cotton birdseye diapers. "One-Size" means one-size fits all and this size is also called "Small". They are the same and they go by both names. But please don't think that "small" means that it gets outgrown like size small covers do, for example. This small means that it fits birth to potty learning, or is a one-size fits all size. We also have a special larger size called size Large. Size large shrinks to about 30x30 inches after washing and are 33x35 inches before washing. The "size large" is a specialty size and is not commonly needed and only sometimes available. The "One-Size", also called "Small", is generously sized and is good birth to potty learning. Our "one-size" size is not very small at all! In fact, our "one-size" is larger than some other brands size large. But our size Large is good if you happen to like doing the origami fold on an older baby but the one-size are good for most other folds on any baby of any age. I think the size large is too much diaper for a newborn and it can be unwieldy to fold. "One-size" also called "Small" is really a great size. Most will be happy with the "one-size" size from birth to potty learning. You can add the Size Half birdseye to it when you need more absorbency or when baby is older you can double diaper. Now, birdseye is a variable fabric and they will never be perfect squares consistently with any brand due to the nature of the fabric, but these are usually reasonably square which does help make folding easier and we strive to make them as square as we possibly can. While these are not expensive at all, they truly are better than other brands for both fabric quality and squareness. I hope you love them as much as I do. They are very nice, high quality cotton birdseye weave. Easy-washing, real 100% cotton. Made in Pakistan. Flats don't get diaper stink. You don't need to strip your diapers when you use flats becuase they really do wash up nicely and easily. Learn how to fold flat diapers and see this on a baby. If you are on a mobile device, click Show Order/CODE to find the place to enter the code. I ordered 54 organic Birdseye flats. 30 large and 24 half flats. They are so soft and very absorbent. I'm very happy with this purchase. We use a large flat in the diaper bag fold with a half flat pad folded, works perfectly. Loving these flats! Cloth diaper newbie and since my grandparents watch my kids for me, they talked me into flats and covers over pockets or all in ones. These clean so well! We pad fold and use Thirsties Duo Wraps and these have not failed! Big enough to accommodate bigger toddlers as well! I love these flats! The pickman fold is so easy to do, search youtube. I can use the one size on my 6 year old and my 2.5 year old. I usually air dry but if I want them softer I do a damp dry and then hand dry them the remaining amount of time. I love these! My favorite flats yet! The size is perfect and they are the softest! I love how they wash up fast and easy!